Manufacturer of a wide range of products which include two stage vacuum pump. With the support of diligent professionals, we are instrumental in exporting and supplying high-quality Two Stage Vacuum Pump. Widely used in industries for their excellent output capacity and precise controls, these pumps are sourced from reliable vendors. 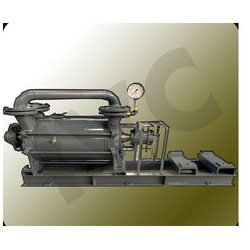 These pumps are manufactured by effective utilization of raw material and modern-age technology in varied configuration for serving diverse needs of customers. Looking for Two Stage Vacuum Pump ?